Yesterday marked the beginning of the cleanse. I decided to blog/put my thoughts to paper to mark my journey during the two week process. Note, I am altering the cleanse a bit to adapt to cooking for one as well as allowing myself a few social events outside of the cleanse this week. Day one wasn’t so bad. Although I cheated and allowed myself an Americano. For breakfast I added some homemade meyer lemon marmalade on my toast with the slightest amount of butter. I used Macrina’s cider whole wheat bread. I enjoyed the avocado tartine with some brussel sprouts and broccoli (I’m using some veggies that I already had in the fridge for economical reasons). I also did make a “big” batch of the Citrus-Shallot dressing. Per the cleanse suggestion I used a Low-Fat No Sugar Added Almond Milk for my Vanilla-Date Smoothie, however I had no ice (I know silly right?) so I proceed to drink the rather thick concoction. I didn’t love this, perhaps when it comes back in the cleanse at a later date I may substitute for something else. Dinner however, this I adored. 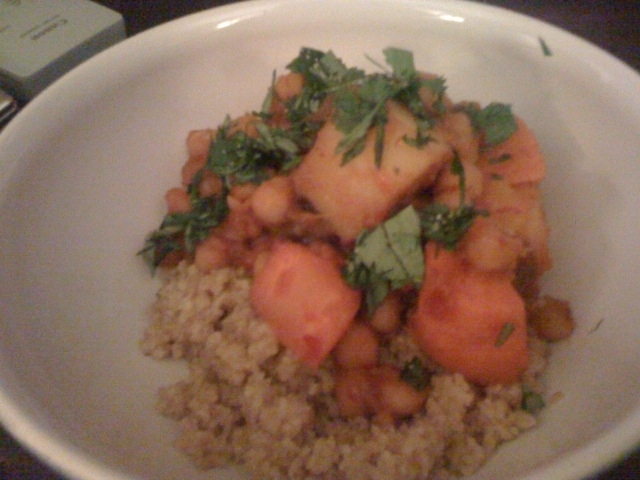 The Ultimate Winter Couscous layered with several spices was a real treat. In order to control portion sizes and volume, I halved the recipe. The other half will most likely be frozen to be used for lunch at a later date. I also substituted bulghur per suggestion, only using olive oil to finish. I omitted the preserved lemon because I was feeling cheap and didn’t want to spend the $8 for one lemon at Whole Foods. Although since I enjoyed this dish so much I may try preserving my own lemons for a fraction of the cost. I didn’t have any saffron, but again with the rich nutty flavor of the bulghur, I don’ think this mattered. I have to admit, I was tempted to divert a bit on my first day. Prior to starting dinner, I swam 35 minutes for my 30 day challenge. I was ravished by the time I got home. Ok, I snacked on a few dried apricots while wait for my veggies to roast. I omitted the snack since it was already late in the evening, but at this point, letting my food settle, I wasn’t hungry rather content with the food from the day. Plus did I mention all of the meals were meatless? I appreciated the fact that I was full despite not eating meat. A gentle reminder to incorporate more veggies and hearty grains into my diet. Today, I’m looking over my week and making alterations based upon my schedule and cooking for one. Looking forward to finishing up Day 2.